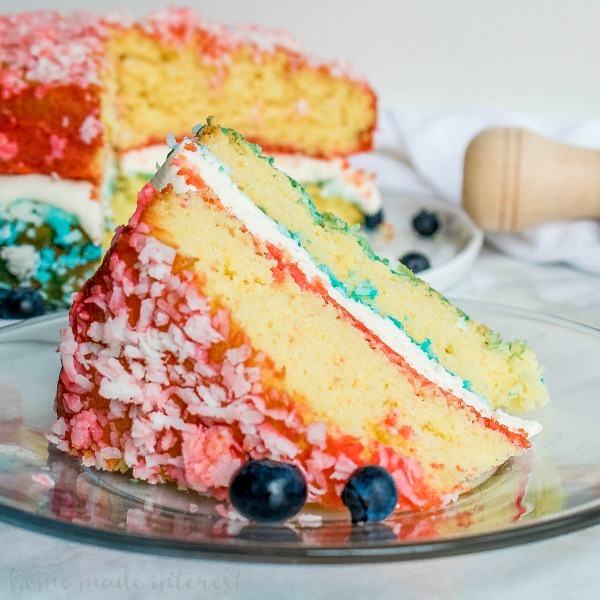 No Bake Red White and Blue Cake - Home. Made. Interest. This post first appeared over at Real Housemoms where I’m a contributor. 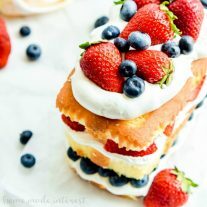 This No Bake Red White and Blue Cake is made with pound cake, whipped topping, and lots of fresh summer berries! 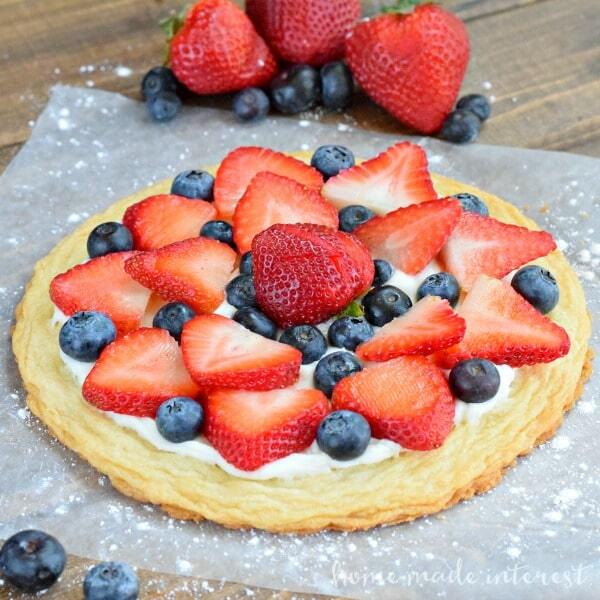 Summer is here and that means berries! Blueberries, strawberries, blackberries, raspberries. It doesn’t really matter which berry it is I love them all but I’m extra partial to blueberries. I can eat them by the handful! In the summer I like to go berry picking at least once and nothing is better than coming home with a bucket full of fresh blueberries that are perfectly ripe. Those pretty, fresh, blueberries don’t need to have much done to them. They are already nice and sweet so I keep dessert pretty simple. Whipped cream, pound cake, and a mix of summer berries that are irresistible. Since no one really wants to slave away baking when they could be outside playing in the sun my summers are filled with easy desserts like this No Bake Red White and Blue Cake. Isn’t it so pretty? Now there are a few ways you can make this but I like to keep it super simple because again, I’d rather be outside in the sunshine….but I still want dessert! 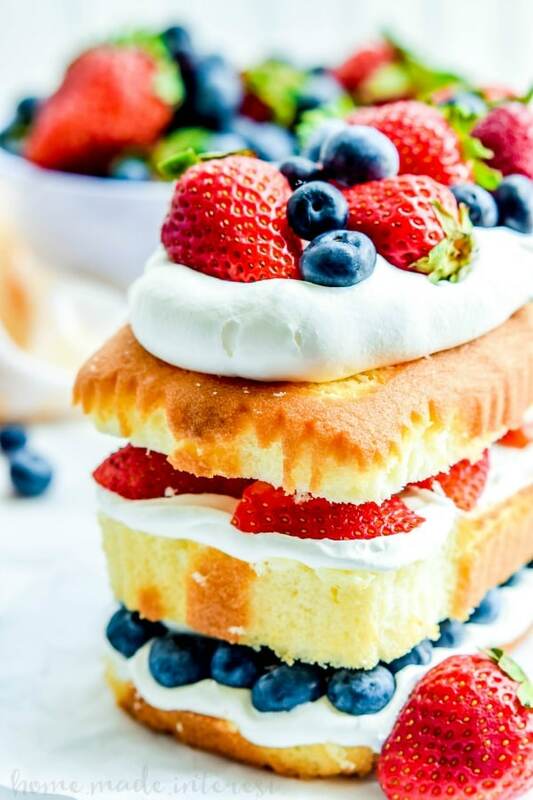 😉 I use a store bought pound cake and whipped topping along with fresh berries to keep it quick but if you have a favorite pound cake recipe, or if you want to make it with homemade whipped cream go for it! I do suggest making a stabilized whipped cream if you do because it will hold up much better, especially if you are taking this to a summer party. Whether you make your own pound cake or buy one from the store you follow the same steps. Slice the cake into three layers, then to the bottom piece add whipped topping and a layer of blueberries. Add a little more whipped topping on top of the blueberries and then place the middle piece on it. Add another layer of whipped topping, then sliced strawberries, and more whipped topping, and place the last piece of cake on top. Then add more whipped topping and lots of fruit on top for a beautiful, no bake cake. All of those gorgeous berries make this cake great for the whole summer and the colors make it perfect for Memorial Day, 4th of July, and Labor Day. Make it for all of your summer parties this year I guarantee there won’t be leftovers. 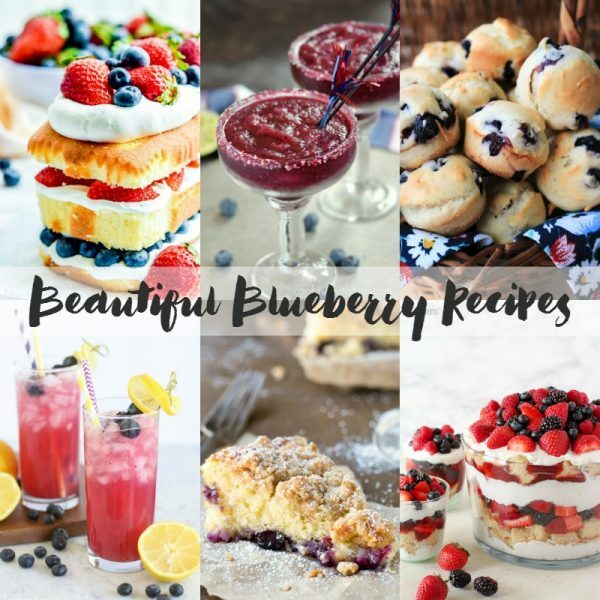 If you love blueberries as much as I do you’re going to want to check out these awesome blueberry recipes from some of our favorite bloggers. 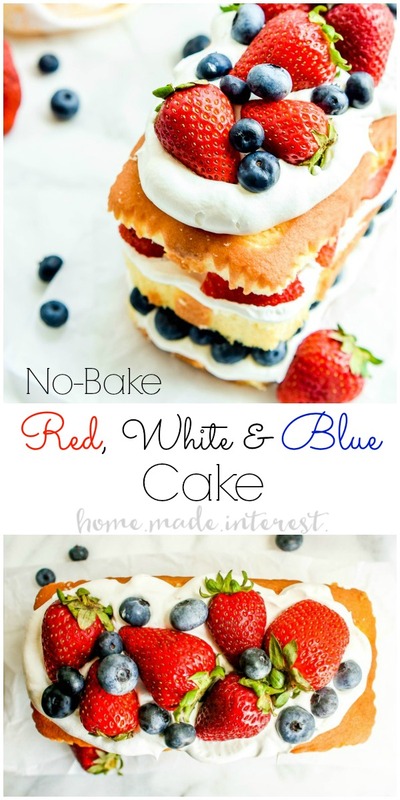 No Bake Red, White, and Blue Cake from Home. Made. Interest. 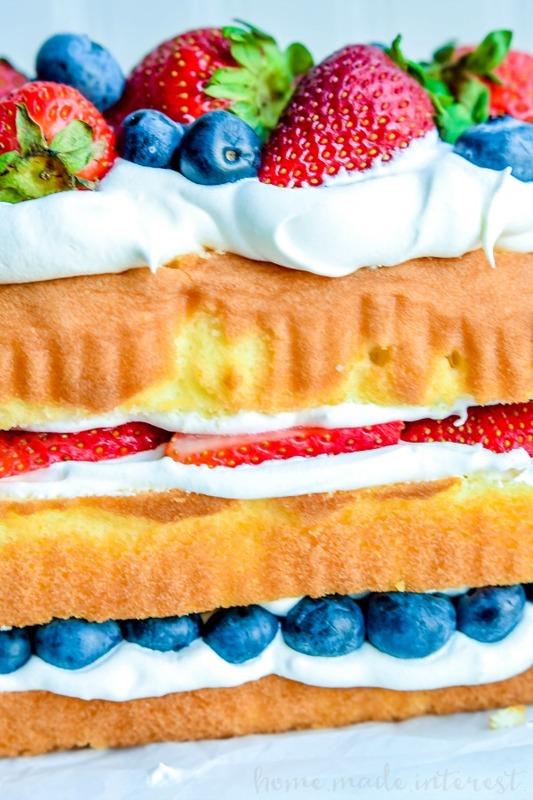 Three layers of pound cake topped with whipped topping, and lots and lots of fresh berries makes this No Bake Red White and Blue Cake perfect for summer! Slice pound cake into 3 layers. Add a layer of Cool Whip, a thick layer of sliced strawberries, and another layer of Cool Whip. Place the top piece of pound cake and top with more Cool Whip and whole strawberries. 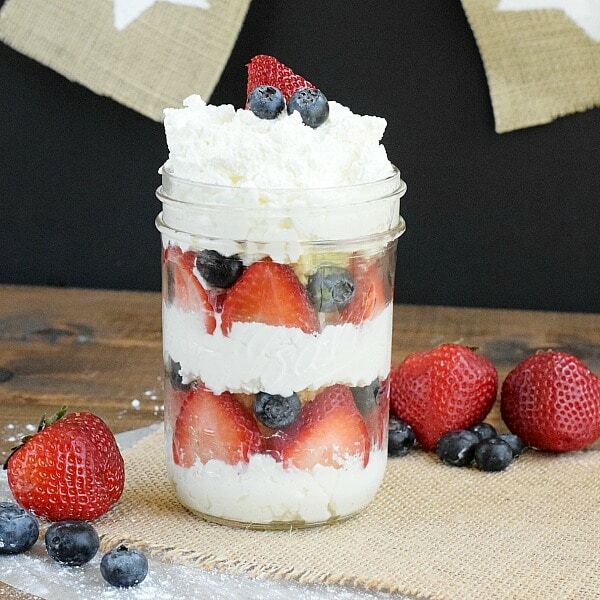 Looking for some more red white and blue desserts? Check these out!